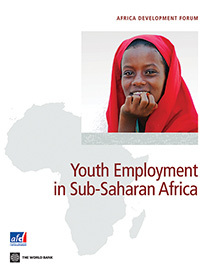 Just under two years ago, I, along with a team from across the World Bank, co-authored a report, Youth Employment in Sub-Saharan Africa , which tackled the growing gap between the aspirations of African youth and the realities of the job markets and what governments should do about it. With an expected 11 million young Africans entering the labor market every year well into the next decade, the findings and main messages of the report remain relevant. Nearly 80% of Africans work in the informal sector on small farms or in household enterprises. Most people in these sectors earn meager incomes. The challenge is beyond unemployment it is that of boosting earnings across the board. Africa’s impressive economic growth over the past 15 years (about 7% a year) was not associated with large-scale job creation or poverty reduction. Much of this growth was in the extractive industries that are less labor-intensive. Although the formal wage sector grew quickly in some countries (10% a year in Ghana) even in the best-case scenario, this sector will not create enough jobs in the near future. The report featured estimates of what kinds of jobs workers would have in 2020 based on optimistic projections of overall economic growth, and high estimates of the formal sector wage job creation that would be associated with that growth, using the cases of countries such as Bangladesh and Vietnam as sources . The results were sobering: while the number of jobs created would be impressive, the structure of the labor force would remain remarkably similar to what it is today—low-income African countries would have close to 60% of workers in agriculture, 20% in household enterprises, 13% working for wages in the services sector, and only 6% working for wages in the industrial sector. Demography and the difference between stocks and flows mean that any change will take a long time. Carry out business environment reforms that attract investment into large enterprises that can create a lot of formal wage jobs, and help make these firms more competitive. Priority reforms include improving access to finance and infrastructure services, improving trade logistics, and easing regulatory constraints to entrepreneurship. Ramp up efforts to support the informal sector. Recognize its importance and ensure the legal status of those who work in it. Provide support by ensuring access to (i) land or (legal) space to operate a business, (ii) public services (such as security services) and infrastructure (such as electricity) so that small businesses can be secure and have a predictable operational environment, and (iii) finance so that even smallholder farmers and household enterprises can invest in their businesses to make them more productive. Ensure that youth have solid foundational skills. Sub-Saharan Africa is experiencing a learning crisis : While more children are attending school, many learn very little. By grade 3, many students cannot recognize a single word of a simple paragraph. At the end of the primary cycle, results from an assessment of math skills in 14 Southern and Eastern African countries found that 60% did not get beyond the designation of “basic numeracy,” and a recent assessment  in 10 Western and Central (francophone) African countries found that 60% did not get beyond the ability to answer brief questions by calling upon factual knowledge or a specific procedure (defined by the authors as the “sufficient” competency threshold). By addressing these urgent education issues, governments could ensure that young Africans have the basic skills to build on through further education or on-the-job experience. Other dimensions of human capital merit action. Governments should put in place programs that ensure early child development; young children who start off with appropriate nutrition and stimulation have greater success later in life. Also, employers demand workers with high levels of socioemotional skills, which are also rewarded in household enterprises. There should be attention to developing these skills; for example, “life skills” training for adolescent girls has resulted in higher earnings. Promote the dynamic private market for vocational education and training (which includes apprenticeships). Priorities include providing information and facilitating access to existing training for disadvantaged youths as well as well as ensuring the availability of better training options (this does not necessarily mean providing these services). In the presence of active training markets, public interventions need to be selective, performance driven, and evidence-based. One interesting finding is that programs that combine training with access to finance (to start or invest in a business) seem to show substantial promise. While there is no silver-bullet that will solve the challenge of youth employment, a number of actions can, and should, be taken to ensure that young Africans are well-prepared for work—and that the work that they will engage in will yield substantially higher incomes than it does today.